So this week, after her younger siblings were in bed, my 6 year old granddaughter and I spent some special time together making some snowflakes. They’re so simple, but turn out so pretty! Cut a pipe cleaner into 3 equal pieces. Place 2 of the pieces together in the shape of an X and twist one around the other one. Take the 3rd piece and twist it around the other 2 to form a six sided snowflake shape. Tie the string or fishing line to the end of one of the snowflake arms. Tie the other end of the string around the pencil, making sure it is the right length for the snowflake to hang suspended in the jar. Trim each arm of the snowflake to ensure it can easily be removed from the jar and will hang without touching the sides. 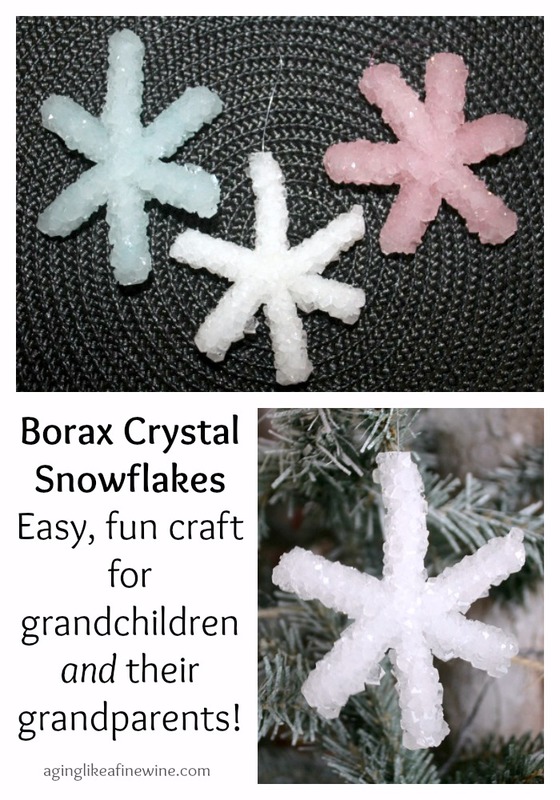 Add Borax to the boiling water (3 tablespoons Borax per 1 cup boiling water). It’s fine if there is some undissolved Borax that falls to the bottom. You can now add some food coloring if you choose. 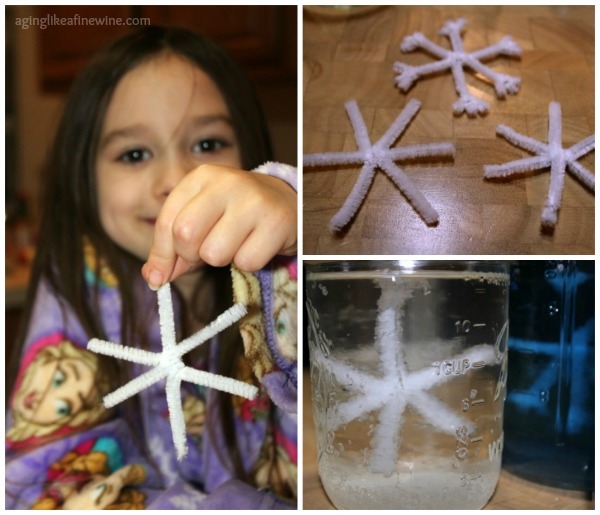 Lower the pipe cleaner snowflake into the jar, resting the pencil across the mouth of the jar and ensuring the snowflake is covered with water and doesn’t touch the bottom or sides. Place the jar somewhere it will be undisturbed and let it sit overnight. The next morning your snowflake is crystallized and ready to be removed from the liquid. Allow it to dry and then enjoy your crystal snowflake by hanging it in front of a window as a suncatcher or using it in a decorative display. Hint: Crystals will also have formed in the bottom of the jar. To remove them simply add boiling water and stir until they begin to break up. If you haven’t made these before, enjoy giving it a try with your favorite little people. P.S. My granddaughter thought the jars were so pretty with the crystal in them and wanted to fill them with water; so of course we did! They actually do look pretty sitting on my kitchen window ledge. what a clever idea! I’m sure Maggie loved doing it. Will have to try this out with Matthew! Thanks! It was so much fun, we actually did it two nights in a row. The snowflakes turn out very pretty. I made these with my daughters when they were younger. I didnt think to add food color. We hung them on the Christmas tree. When Christmas was over we wrapped them up and packed them with the decorations for the next year. They lasted for several years. Thank you for sharing your experience with making these. I have wondered how well they would last, so that’s good to know. They would be beautiful on the Christmas tree. I’m sure we’ll be making more! Such a fun idea! My grandkids would love this! I’m sure they would. It was fun and the snowflakes turn out so pretty. Thank you Teresa for partying with us at Blogging Grandmothers Link Party. I shared your post on my social media sites. Thank you very much; I appreciate the shares! What a fun way to spend a cold day with the lovebugs. They look so happy. Thank you for linking up with us at #blogginggrandmothers. 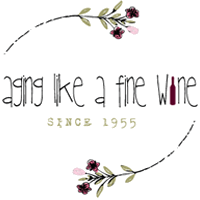 I have shared your post on my social media. 🙂 See you next week. It was lots of fun! Thank you for sharing this on your social media. These are so cute. I have never heard of doing this. I have got to try these! Making them was so much fun that we did it two nights in a row! I think I made these as a child – along with the window stenciling that was standard in the 50s in homes with kids. Thanks for reminding me of these. I think next year, for sure. They’d be great gifts for kids to make and give to their parents! They would be! We will be making them for the tree next year, I’m sure. Thanks so much for stopping by and reading.